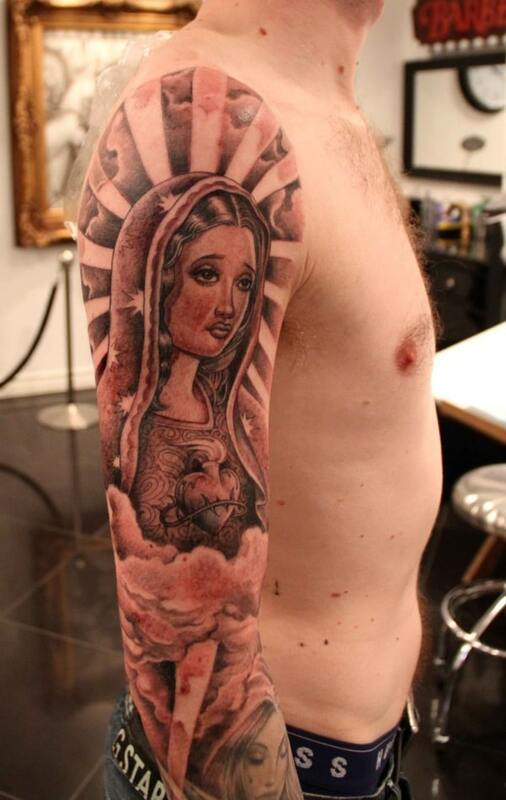 There are so many religious tattoo ideas these days that choosing can be quite challenging. Though sad, it’s very true that tattooing used to be taken as unreligious and disrespectful in those days. We should be grateful for changing times if not, this remarkable art form that needs just colored ink and a body would have been outside our experiences. Who would have thought we would one day have tattoos related with religion. 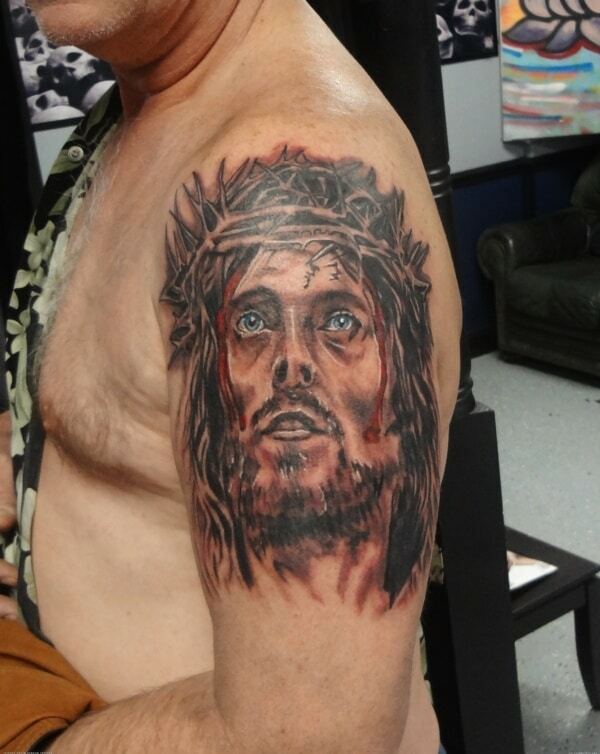 A lot of tattoo lovers now have religious tattoos as their favorites. This is especially true for tattoo lovers who like being guided by God’s words at all times. 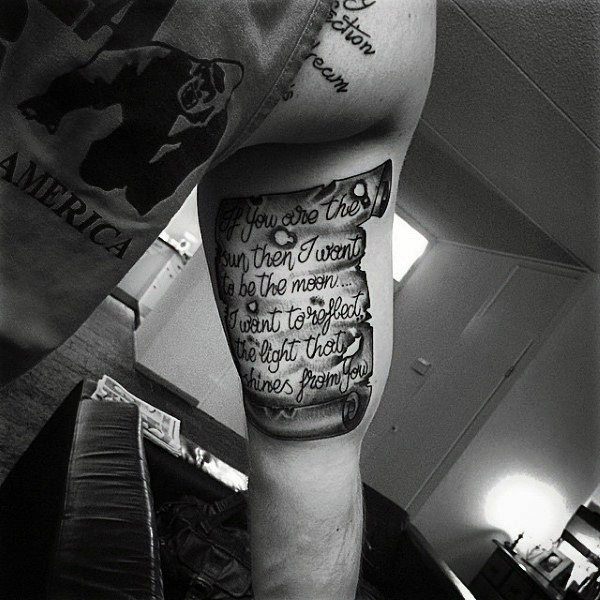 Several book and tattoo lovers claim their favorite quote or text tattoo represents their dreams, ideals and beliefs. 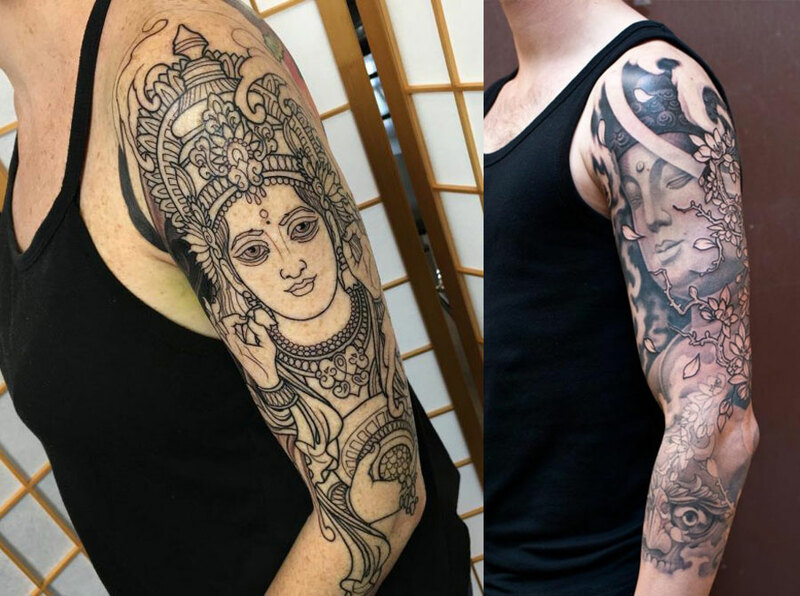 Since different religions have different followers, separate sleeve religious tattoo designs are progressively becoming more popular across the globe. The cross is a symbol of love, faith and affection for loved ones. 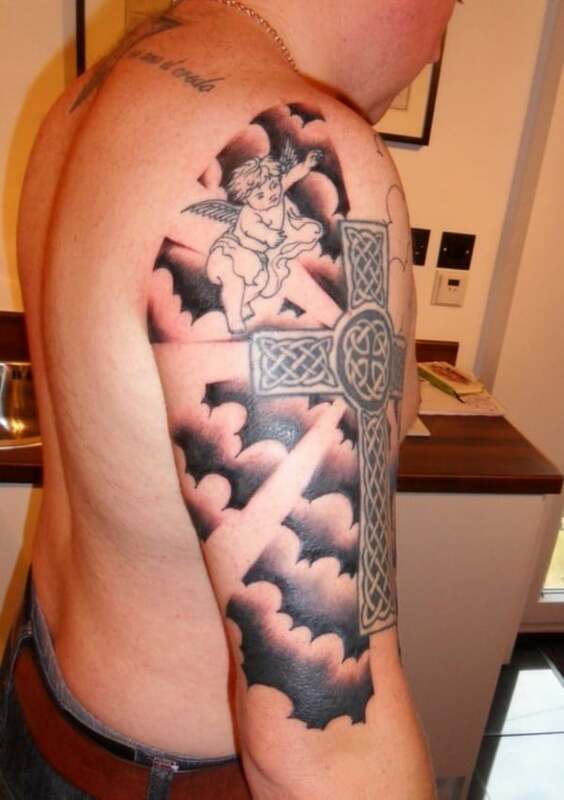 Sleeve cross tattoo designs are admired as they effortlessly and openly satisfy the holy soul whenever necessary. You can wear Christian tattoo designs in company of the cross in tribal and Celtic arts. Additionally, they are the most popularly demanded in varying exciting colors that fulfill your wishes these days. A cross on your sleeve tells the world your belief. 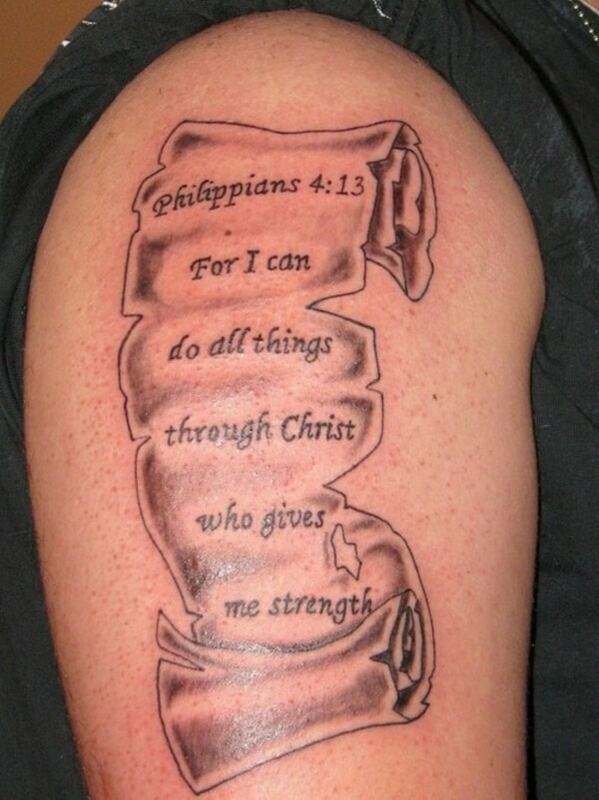 This is another design that comes to your mind immediately you begin considering going for a Christian tattoo design. You may prefer the drawing of Jesus watching out over his children sitting among peaceful birds high above in the blue sky. You can also ink Jesus on the holy cross and even detail the design with wings for emphasis. The ideas you can come up with and implement with this design are quite infinite in number. Praying hands symbolize a deep connection with Jesus Christ as well as the tremendous power of faith. Varying designs that include praying hands with a chain hanging down from them, praying hands with a cross pendant and praying hands drawn with angels are quite famous. You can also draw the two hands linked together praying for mankind’s wellbeing and ink in rosary beads. Prayer as we all know works miracles in lives. Many times, you meet people who have notable encounters and experiences with certain portions of bible scriptures. For such people, they mostly believe that tattooing such scripture portions on their body is the best means of keeping the memory alive. 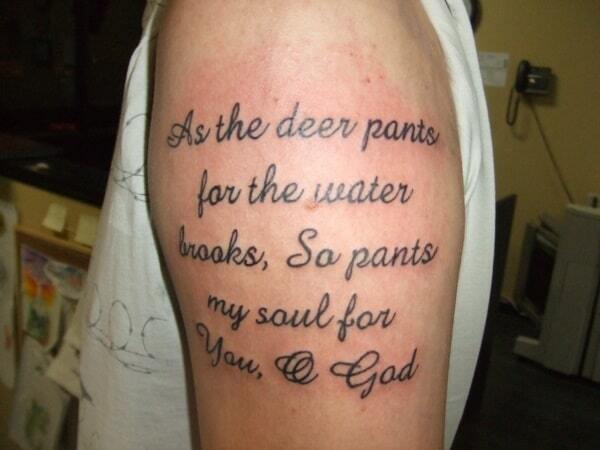 A variety of quotes from the holy Bible are now the new fashion statement. They are tattooed onto the body and are sometimes detailed with rosaries and so on. Without Virgin Mary, who gave birth to humanity’s creator, the latest trend of tattoos and complete details of Christian tattoo designs will surely be quite incomplete. It will be great to tattoo the silent Mary with her child Jesus, in her laps. Mixing floral designs in Mary’s dress up will appear elegant too. 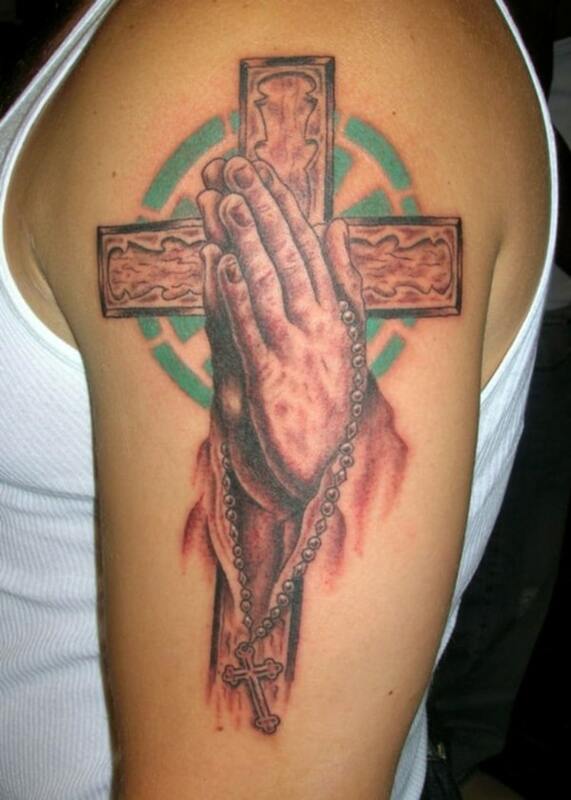 To give the tattoo design further elaboration, you may also wish to add rosary beads and the sacred heart. Proverb tattoos which depict masculinity are wisely liked by men. They are indirect quotes of what such men look up to. It can be inked as the proverb was quoted in the Bible and sometimes detailed with a pigeon or praying hands. This is used to present the fact that anybody suffering any of the common challenges of life will surely be saved by Jesus. There are numerous variations you can choose from. The strong and most powerful intentions of most people are represented by inspirational quotes. People are self-inspired and motivated to carry on and work towards overcoming any struggles they are facing, when they have the Christian inspirational quotes inked on their sleeves. They use the strength they derive from the tattoos to fight opposing thoughts and overcome all internal religious conflicts. They are inspired to more religious strength.